The hot summer season is on. In this unbearable heat, you really don't know what to drink? Raw Mango juice recipe is the best drink to drink. Some say coffee & tea cools you down whereas others say that cold drink is a better option. It's up to you. Cooling down is ease, so increase on different refreshing summer drinks. When summers are hot and you are fed up with it, then have Green mango juice. Aam Panna juice is considered as one of the most favorite traditional Indian mocktails for summer. Though this juice is easily available in the market, it consists of added fake colors & taste, which stand nowhere against the traditional homemade Indian mocktails. In order to save yourself from boiling heat & to maintain your body temperature, Aam Panna recipe is really effective. Preparing green mango juice is really easy. Thus, let's know how to prepare aam Panna recipe. Green mango juice is most often juice make in summers. This juice is a summer cooler & assists greatly in beating heat summers. At home, usually, we avoid unhealthy soft drinks in summers and prefer to consume traditional homemade juice made from fruits such as watermelons, muskmelon, coconut, lemon juice, cucumber juice, raw mango juice etc, all these fruits are great summer coolers and assist a lot in tolerating heat. The taste of raw Mango juice is slightly sweet and sour to taste with a hint of black salt and cardamom. 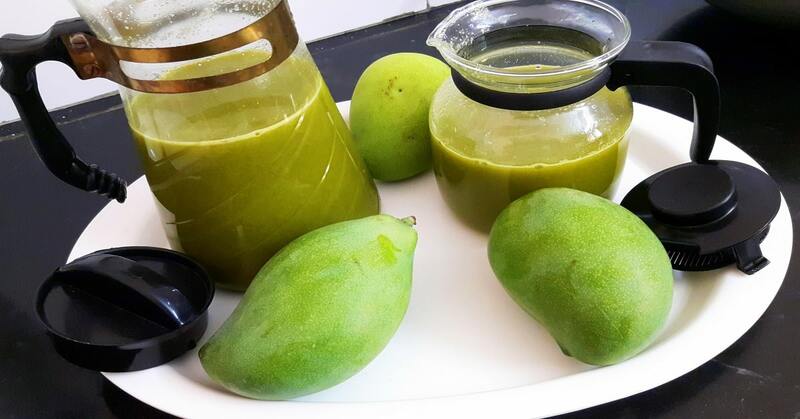 Raw Mango juice recipe provided here helps you in preparing a lip-smacking aam Panna juice. It takes just 20 minutes to make raw Mango juice, 15 minutes to prepare and 5 minutes to cook. Boil raw mangoes in 3 cups of water or Take a pressure cooker and steam the raw mangoes for 3-4 whistles till they become pulpy and soft. Cool & remove soft mango pulp from the seed & skin and grind to a smooth paste. By boiling 1/4 cup sugar in 3/4 of water prepare sugar syrup till it completely gets dissolved & simmer for 4 more minutes. Turn off heat, cool & store in the fridge. In order to prepare one glass of Aam Panna juice, in a blender, add 4 tbsps of mango pulp, 1/4 tsp roasted cumin powder, 2 tbsps of sugar syrup, 3-4 black peppercorns, 1/4 tsp of black salt & 6 to 7 mint leaves & blend to combine well. Then add 1 1/4 cup chilled water & continue to blend for few seconds. Then pour into a tall glass with crushed ice & serve. Generally, while preparing aam Panna juice, sugar or jaggery is added to make juice sweeter. Mostly, it is suggested to avoid white sugar in cooking and use organic golden sugar or cane sugar. Some people will add evaporated sugar cane juice that will take an aam Panna juice to another level. Adding sugar cane juice to aam Panna juice gives a refreshing mild taste and a slight favor of sugar cane juice. It also changes the color of raw Mango juice to a brown cola color because of the evaporated sugar cane juice. Making raw Mango juice with organic jaggery, black pepper and cardamom and this combination is much different and the color changes to golden yellow. You can prepare your raw Mango juice either using jaggery or sugar. If you add sugar, this will make juice a light creamish or pale or lemon yellow color. It is up to you what you would like to add. The leftover mango pulp from can be kept in a plastic container & stored in the freezer. Use this mango pulp as required to make Aam Panna. In order to prepare jaggery syrup, place 1 cup of jaggery in two cups water & allow dissolving. Strain to remove dirt & bring the liquid to boil. Then sim on low flame for 7 to 8 minutes till it somewhat thickens. Turn off heat & cool and store in a bottle & refrigerate. Adjust jaggery syrup or sugar syrup based on the sourness of mango. Adjust spices as per the taste. Few mangoes are very fibrous & hence cooked mango i.e. grounded requires being strained prior to use. "Enjoy this summer refreshing drink with your Near & Dears"